HBSA is a well equipped, modern radio station. We were able to bring HBSA up to modern industry standards with the help of a very generous donation from the AAHB staff lottery fund. 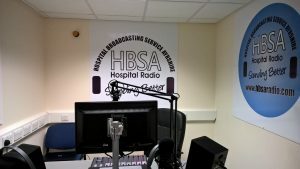 Located in the main building in Crosshouse hospital HBSA has two studios which are very different from each other. This is our main broadcast studio. S1 is equipped with the most up to date “Synergie” broadcast system from Clyde Broadcast in Glasgow. Starting out as the service and repair arm of Radio Clyde this company are now one of the leading manufacturers of broadcast studio packages. The Synergie system is an all-in-one solution which allows the presenter on air to play music, ads and jingles from one screen and also have access to a Cd player and outside sources. This is an extremely easy system to learn and use, trainees are always surprised how little time it takes to learn how to use it. With the layout in S1 it is easy to have multiple presenters or guests around the table to join in with broadcasts. This studio is laid out totally differently to S1. This studio is equipped with twin Cd players, a Minidisc unit and a basic computer system. These are all fed through an Arrakis Systems Arc-8 mixing console. This studio is often used by presenters who broadcast from a Cd collection and need to work from disc to disc. 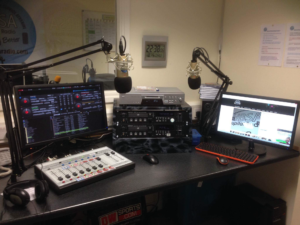 The computer and the MD unit can be used for playout or for jingles and sponsor messages. In addition to this S2 is very accessible to wheelchair users with plenty of space for the presenter to sit side by side with an assistant if needed. 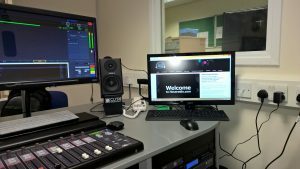 S2 also houses the computer which carries our custom made recorded playout service which ensures that HBSA is always on air.